‘Fill the mill’ is the focus for Red River Resources as it moves into 2018 as a producing miner. The mill quickly ramped up to an annualised processing rate of 325ktpa after production began in September, however the company has its eye on taking the plant to its nameplate capacity of more than 650ktpa. The company had four drill rigs from Charters Towers-based contractor Lloyd Weller Drilling working across its Thalanga assets in November, expanding known resources and furthering exploration at Red River’s Liontown East discovery. 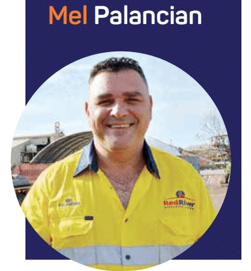 Managing director Mel Palancian said Red River Resources had a planned sequence for mining – starting with the West 45 underground mine and progressing to the Far West and Waterloo sites. “We’ve been drilling West 45 and finding more resources there, so we are currently in the process of updating the resources and reserves for West 45 and have just announced an updated mineral resource and a maiden ore reserve for Far West,” Mr Palancian said. “We’ve got a drill rig at Waterloo, which will be our third mine, and are conducting infill drilling there. That will move to an extensional drilling program there – so hopefully we’ll fi nd more resources. There is also hope for new discoveries around Thalanga to further extend the current life-of-mine forecast of five years. “There are a lot of targets there,” Mr Palancian said. General manager of operations Karl Spaleck believes mill capacity could be pushed out beyond 650tpa with improvements. He also takes a positive outlook on the potential to draw that feed from the immediate area and build a 20-year mine life around the processing plant. “I think potential is outstanding around here – this place is underexplored,” Mr Spaleck said. Mr Palancian said that Red River Resources would also be on a lookout for further opportunities in base metals.